Vasculitis literally means inflammation of the blood vessels. It is defined by the presence of inflammatory leukocytes in the vessel walls resulting in reactive damage and loss of vessel integrity which can lead to rashes, bleeding, ischemia or necrosis. Vasculitidies are rare and can be a primary process, or secondary to another underlying disease or autoimmune condition. They can affect people of any age, but some types occur more in certain age groups and ethnicities. Classically, they are categorized by the predominant sizes of the blood vessels that are affected, and also by the presence or absence of antineutrophil cytoplasmic antibodies (ANCA). Large vessel vasculitidies include Takayasu Arteritis and Giant Cell Arteritis (GCA), or Temporal Arteritis (which occurs in about 15% of those with Polymyalgia Rheumatica). 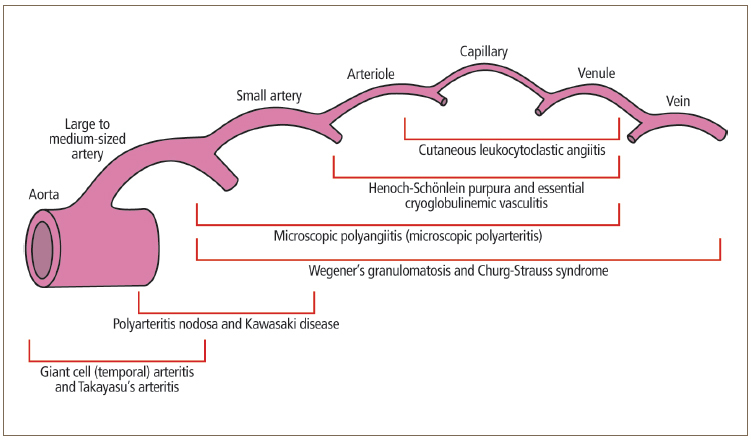 • Medium sized vessel vasculitidies include Polyarteritis Nodosa (PAN), Kawasaki disease, and primary CNS Vasculitis. • Small vessel vasculitidies include Wegener’s (now named Granulomatosis with Polyangiitis or GPA), Microscopic Polyangiitis, Churg-Strauss, which are ANCA associated. Henoch-Schönlein purpura, Cryoglobulinemia, Hypersensitivity and Leukocytoclastic Vasculitis, and secondary to conditions like Lupus and Rheumatoid Arthritis. Vasculitis can also be secondary to medications, or infections like Hepatitis B and C, HIV, CMV, EBV, Parvovirus. Symptoms are extremely varied, depending on the cause and which organ is involved; they can range from very mild to quite severe. 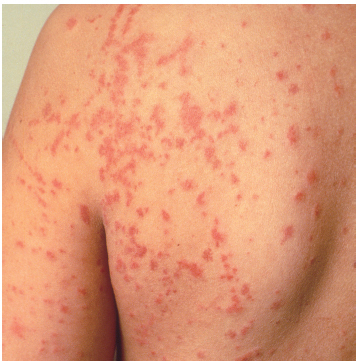 For example, Cutaneous Leukoytoclastic Vasculitis affects the smallest blood vessels and can cause rashes including palpable purpura (see below), nodules or ulcers. 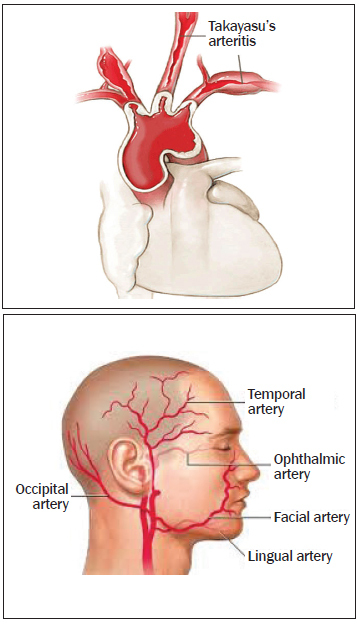 On the other hand, Giant Cell Arteritis and Takayasu’s arteritis affects the larger arteries and can cause more serious neurological and cardiovascular symptoms.The presence of vasculitis should be considered with systemic symptoms and evidence of single and/ or multiorgan dysfunction. Diagnostic evaluation should also consider age and gender, a detailed history, including drug use, and infectious disease exposures. General labs should be obtained to identify which type of disorder, and the degree of organ involvement if any. Additional testing can be directed by a rheumatologist, and depending on pretest probability can include ANA (Anti-nuclear antibodies), complement levels, ESR, CRP, and ANCA. Other useful tests sometimes include EMG/ NCS (electromyography/nerve conduction studies), imaging including MRI/MRA or ultrasound, arteriography, and most definitively: Tissue Biopsy. Treatment depends on the nature, severity and type of vasculitis, as well as what organs are affected and to what degree they are affected. For example, in mild Hypersensitivity vasculitis due to a drug, discontinuing the offending drug may be adequate, along with antihistamines and observation. However, for other vasculitidies that cause pulmonary, neurologic, or renal manifestations, aggressive treatment may be required, including corticosteroids (Prednisone), and immunosuppressive therapies including Methotrexate, Azathioprine, Cyclophosphamide and Rituximab. The goal is to induce remission, to minimize drug toxicity and to monitor for signs of recurrence. Disease outcomes vary depending on the type of vasculitis. It is usually good for patients with Hypersensitivity vasculitis, Giant Cell Arteritis, or Henoch-Schönlein purpura. On the other hand, some forms of Polyarteritis Nodosa and Wegeners Granulomatosis have five-year survival rates of 60-70 percent respectively. Fortunately, there are effective therapies currently and ongoing research has provided promising results in sustaining remission even among those with serious disease.